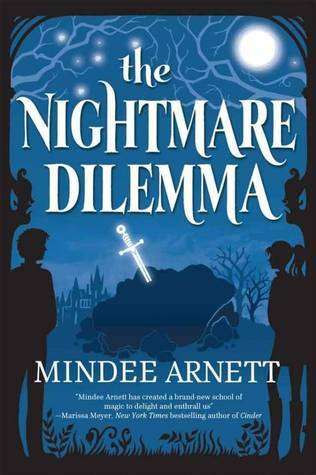 Much like the first book in this series, The Nightmare Dilemma is very enjoyable and cute. But I can't help but note that, also like the first book, something seems to be missing--enough so that the book falls short of being memorably awesome. I just can't seem to put my finger on what it is that doesn't work quite right for me. The narrative tone of the first book felt strangely detached; the narrative tone of this second book, however, feels... off. I can't quite reconcile the tone of the story with the subject matter depicted in the story--they just don’t feel like they match up. Nonetheless, the story was enjoyable and the characters were also likable. The world of Arkwell Academy has so much potential to extend into many story lines (and still gives me the same feel as the Harry Potter world, which I also loved immensely). I'm not sure how the trilogy will conclude, but I wouldn't mind reading more stories that could take place within the same fictional world as Arkwell Academy, as again, there is so much potential for lots of storytelling. Some of the stuff mentioned in the blurb don't exactly present in the actual book, but none of it really too significant, honestly. As much as I enjoyed the book, I can't say that it's the most memorable experience. And, as I already stated, the narrative tone through Dusty doesn't seem to match the subject matter being presented in the book either; Dusty has a fairly juvenile tone of voice, but the things that are happening feel like they are more mature and serious. It actually made the narration slightly distracting, especially when Dusty spends more time than necessary drooling over Eli, repetitively admiring his "hot body" or something to that effect. But the mystery was fun and interesting and the ultimate Big Baddie (though unsurprising) made for a good twist in the overall story line. There was a lot of stuff going on, ranging from controversial matters as well as some social and human causes that parallel ongoing conflicts in the real world throughout history. It inspires some thought, but with the flippant tone of the narration, again, it makes it hard to focus on any of it. Overall, the story was interesting, though a lot of the events were predictable, even the development of the romance between Dusty and Eli was slightly eye-roll-worthy predictable--not that it was handled badly or anything, but... well... I guess it works. Selene is still cool and awesome as the awesome best friend and even Lance makes a great potential side-kick type character for future purposes. I expect him to have more book time in the last book. One thing is for sure: I am very much still interested in reading the last book to see how everything turns out in the end.